Head of the Hatikva neighborhood in Tel Aviv blasts government for failing to deal with violent riots by infiltrators. Shlomo Maslawi, chairman of the council of the Hatikva neighborhood in Tel Aviv and a member of the Tel Aviv city council, on Tuesday evening blasted the government for failing to quell the violent riots by infiltrators in southern Tel Aviv. Over the past few days, videos of brutal fights have been circulated on social networks as part of an ongoing conflict between supporters of the regime in Eritrea and its opponents. On Sunday, a massive brawl between dozens of infiltrators broke out in southern Tel Aviv, with police arresting 13 people. On Tuesday, a violent confrontation broke out between Eritrean infiltrators at the old bus station compound in Tel Aviv. 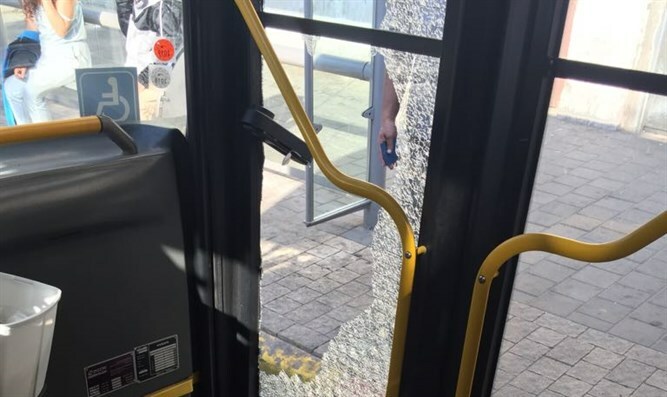 A bus window was smashed during the confrontation as a result of rock-throwing. Police arrested two people involved in the violent clashes. "The Israeli government, in its helplessness and by deciding not to decide, has made the situation in southern Tel Aviv unbearable and turned the lives of the residents to hell," Maslawi said Tuesday. "The violent riots of recent days are further proof that the infiltrators feel a great deal of confidence in their lives here, and know that they will never be deported and will never be punished for their actions," he added. "We have said in the past, and we repeat once again: Without incentives - compensation for those who leave voluntarily, facilities for detention and economic sanctions for employers - the infiltrators will never leave the streets of southern Tel Aviv," continued Maslawi. "The government of Israel must immediately address the matter and get the infiltrators out of southern Tel Aviv, one way or the other," he demanded. "The residents of southern Tel Aviv are tired and afraid and want quiet and security, once and for all."